The St. Olms Canal South-One is the residence of Nalvilie Saren accessed from outside and located on the Canalworks level in the southern part of the St. Olms canton in Vivec. Just in front of the entrance door is a dresser containing some of Nalvilie's merchandise, including five common shirts, six robes, two left gloves and two right gloves, on top of which lie three bottles of mazte and two loaves of bread. 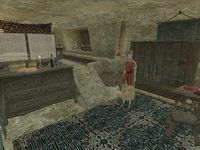 To the right as you enter is a small table with a common shirt and robe lying on top of it, two baskets having a little chance of containing random special and marksman loot, as well as a closet, where Nalvilie keeps most of her merchandise, including two random pairs of common pants, four random pairs of common shoes, one random piece of expensive clothing, three pairs of common pants, six shirts, three belts, one robe, two rings, and three amulets. Next to the closet, in a small alcove, is a shelf, on top of which rests a quality restore health potion. 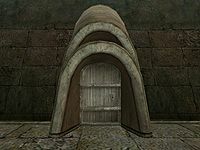 Slightly elevated is Nalvilie's bedroom, where you can find her bed, as well as a barrel and sacks containing either random ingredients, or specifically cheap food. In the northeastern corner is a small dining table, with a piece of rat meat on a plate and a loaf of bread on top.